A pinched nerve in ankle, which is called tarsal tunnel syndrome or posterior tibial neuralgia; is a condition in which the tibial nerve is subjected to compression as it makes its way through the tarsal tunnel. Know the causes, symptoms, treatment, and exercises for pinched nerve in ankle. Posterior Ankle Impingement is a painful condition which an individual experiences at the back part of the ankle as a result of compression of the bone or other soft tissue structures due to excessive plantar flexion of the foot. Know who is at risk for posterior ankle impingement, its symptoms and treatment. Cracking of the ankle joints not only gives a feeling of relaxation and pleasure but also eases the uncomfortable feeling that comes with a hike, sprint or run. There are two questions that come to mind about cracking ankles. The first question is why do my ankles crack and the second question is whether it may cause some harm or injury to the ankle joint. Some people often have weak ankles, the causes of which are many. Effects of weak ankle include symptoms like pain and limited ankle movements, exercises to strengthen ankles can help to a great extent. Ankle joint abscess is a development of tender mass filled with pus around the human ankle region with pink or reddish appearance. Know the causes, signs, symptoms, treatment, prognosis, recovery and prognosis of ankle joint abscess. When any of the bones or ligaments in the Lisfranc region gets torn or sprained then it is termed as Lisfranc Sprain. Lisfranc Sprain or Injury should not be taken lightly as it may affect the functioning of the foot normally. Know the causes, symptoms, treatment and healing time for lisfranc sprain. Ankle Osteoarthritis can cause severe pain, swelling in the ankle and in some cases visible deformity. Ankle Osteoarthritis is an age related condition and usually starts in the mid 40s. Treatment for ankle osteoarthritis includes surgical and non surgical treatment options. Know the causes, symptoms, treatment, recovery period and diagnosis of ankle osteoarthritis. What Causes Ankle Edema and Natural Ways to Get Rid of Ankle Swelling? Ankle Edema is a medical condition in which there is swelling of the ankles due to collection of excessive fluid in tissues of ankle and foot. Majority of instances of ankle edema or ankle swelling resolve by just elevating the legs for some time, especially while sleeping so that the blood flow to and from the leg gets normalized. Ankle Joint Sprain is a painful ankle joint disease caused by injury or inflammation of the ankle joint ligament. Severity of ankle joint sprain is described as Ankle Joint Sprain of grade 1 to 3. Know the causes, types, symptoms, treatment- conservative, specific, PT. Ankle Joint Tendonitis or Ankle Joint Tendinitis are one and the same thing. Know its causes, symptoms, treatment, and diagnosis. Entire period required to heal the ankle fracture and recover to normal ankle muscle activities could be 16 to 20 weeks. Know the types, classification, signs, symptoms, treatment, surgery, recovery of ankle joint fracture or broken ankle. 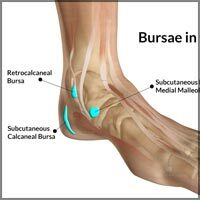 Ankle joint bursitis is an inflammatory disease of bursa positioned around the ankle joint. Know the causes, symptoms, treatment- Conservative, PT, NSAIDs, Surgery. Causes of ankle joint arthritis include osteoarthritis, rheumatoid arthritis, psoriatic arthritis, septic (infected) ankle joint, traumatic arthritis, pseudogout, gout. Know the causes, symptoms, treatment- NSAIDs, opioids, pt, surgery. Osteochondral lesion of the talus, also known as OLT, is a disorder, which consists of a section of damaged cartilage. Know the grading, symptoms, causes, treatment. Ankle joint is made up of two joints, which functions together to achieve flexion(upward),extension (downward) and lateral (side to side) movement of feet. Understand Ankle Joint, know about the supporting ligament, tendons, muscles.